One summer night in June, an initially unremarkable cosmic flare soon became one of the most observed and puzzling objects ever discovered. The comprehensive observations of the GROWTH team of astronomers shed light on what may have happened. The flare was first registered in the ATLAS survey designed to look for transients - flashes in the sky that carry signals from violent cosmic explosions such as supernovae, merging neutron stars, stars being eaten by a black hole and the like. Assigned the computer-generated catalog name AT2018cow and immediately nicknamed the “Cow”, this cosmic event quickly attracted the attention of astronomers around the world including the GROWTH co-investigator Daniel Perley, an assistant professor of astronomy at Liverpool John Moores University in the UK. 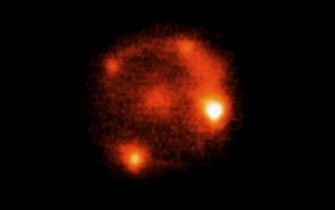 Perley employed many of the optical telescopes in the GROWTH global network of observatories to closely follow up the object for more than a month after detection. The rich dataset revealed that the material ejected after the explosion was expanding at very high speeds. This may have contributed to the very rapid brightening of the object, which reached peak brightness in just two days rather than weeks, which is more common for known types of supernovae. As optical astronomers in GROWTH were keeping their telescopes on the Cow, Anna Ho, a GROWTH PhD student at Caltech, was observing it with the Submillimeter Array (SMA) in Hawaii and the Atacama Large Millimeter Array (ALMA) in Chile. At later times, as the Cow was fading, the GROWTH team observed subtle bumps and wiggles in the optical data rather than the smooth decline in brightness that is more typical for supernovae. According to Perley, this suggests that there is an additional source of power, or “central engine” that keeps pumping energy into the expanding material. Meanwhile, Ho combined her radio data with publicly available X-ray data from NASA’s NuSTAR and Swift missions and arrived at the same conclusion: the Cow was an “engine-driven” explosion, continuously energized by either a black hole or a fast-spinning neutron star formed in a supernova, known as a magnetar. Half a year after the Cow was first spotted, astronomers continue to debate what it is and how it really happened. The most favored interpretation, supported by the GROWTH team, is that the Cow is an exotic type of supernova that left behind a magnetar central engine. Other teams suggest that a black hole ripping apart a type of star called a white dwarf may have instead caused it. “Fast transient surveys and well-coordinated follow up with networks of observatories such as GROWTH can really give us a new window into what is happening in these brilliant explosions.” – added Ho. The study led by Daniel Perley, titled “The Fast, Luminous Ultraviolet Transient AT2018cow: Extreme Supernova, or Disruption of a Star by an Intermediate-Mass Black Hole?” is accepted for publication in the Monthly Notices of the Royal Astronomical Society. The study led by Ho, titled, "AT2018cow: a luminous millimeter transient" is accepted for publication in The Astrophysical Journal. GROWTH is an NSF funded project, led by Caltech with 16 international partners that conducts frontier research in time domain astronomy. 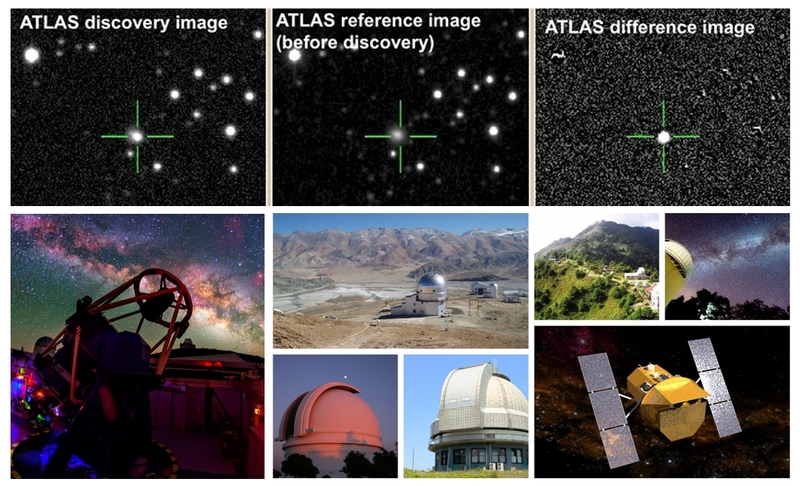 Image Caption: The bright object dubbed the Cow was first discovered in the ATLAS survey (top panel). Astronomers around the world pointed their telescopes to follow the Cow. The bottom panel displays the telescopes in the GROWTH network that were used to study the mysterious cosmic explosion. From left to right and top to bottom: Liverpool Telescope, Himalayan Chandra telescope in India, Lulin Observatory in Taiwan, Mount Laguna Observatory, Palomar Observatory, Mitsume Observatory in Japan, and the Neil Gehrels Swift Observatory (space). Image credit: NASA, Caltech/Palomar, ATLAS team, Daniel Lopez/IAC. Caltech News - What Astronomers are Gleaning from a Big Blast called "Cow"